I glance momentarily down at the digital speedometer and see a number I’m not expecting. And given that I’ve no wish to become the first person to have his collar felt for speeding in a Nissan Leaf, I lift off and let the numbers tumble down to something legal. Does Nissan’s new electric car have the legs for real roads? Absolutely, as demonstrated by my unplanned experience of 140km/h (about 87mph). I blame the speedo on this left-hand drive, pre-production car, which refuses to display miles per hour. Plus, the uncanny quiet inside the Leaf, even at speed, makes it hard to judge velocity. 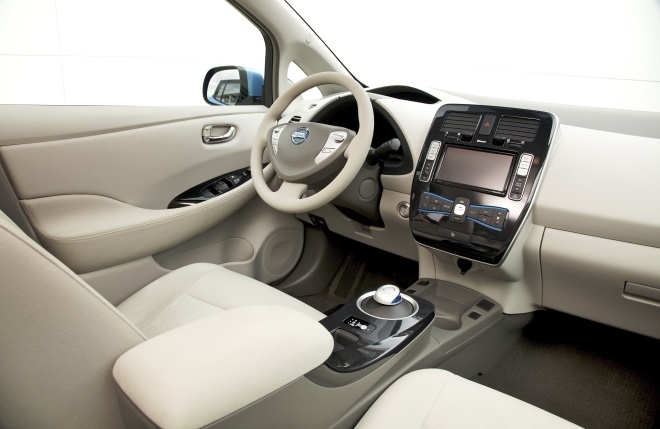 Driving a Leaf really does demand a recalibration of the senses. At motorway speeds, below its 90mph electronic limit, this battery-powered car feels safe, strong and predictable. Getting up to speed is no trouble at all – even above 50mph the throttle responds with enough urge to make lane-changing and overtaking a drama-free experience. There is a catch, of course. At 120km/h you’ll see your trip meter click upwards every 30 seconds, but you’ll see your range prediction ratchet downwards at a much faster rate. At the start of my right-lane blast the batteries were good for 160km or so, but after just two minutes and little more than 4km of progress, the range has more than halved to around 70km. That doesn’t mean I’ve squandered more than half the stored charge in a few miles – the range meter is a prediction, after all. “Keep this speed up and you’ll be done in 70km,” the dashboard is telling me. And as I lift off, slot back into the slow lane, and stop driving like an idiot, the range starts to climb back up. As I swing off the dual-carriageway and brake for a roundabout, it’s reached 120km and is still climbing. The lesson is simple: drive sensibly, you’ll go further. The Leaf’s dashboard proves to be a very informative companion. It’s a double-deck affair, not dissimilar to that in a Honda Civic. Over the rim of the wheel you can see the digital speedometer, set back toward the windscreen’s base, alongside a tree-symbol economy meter. Lower down, through the wheel, you can see a battery charge gauge with embedded range prediction. Sweeping across the lower dash is a big left-to-right meter showing instantaneous power demand or brake regeneration level. And finally there’s a battery temperature gauge, plus a conventional trip computer. Over in the centre console, a whole range of other displays can be conjured up, including a satnav map with a circle showing reachable destinations at current speeds, overlaid with the locations of public charging stations. The setup is very good but not perfect. No doubt some things will be fixed before series production begins, such as the way the steering wheel boss obscures part of the trip computer. I also felt the centre console screen was mounted far too low for satnav use, but this seems unlikely to be moved between now and March, when UK deliveries begin. Overall, the cockpit feels comfortable and slightly more snug than expected. Visibility is mostly good, with large and well-placed door mirrors, with only the steeply raked windscreen pillars spoiling the view – as they do in so many modern cars. The major controls all felt nicely weighted, particularly the brakes. The transition between mostly regenerative braking and mostly mechanical braking is absolutely imperceptible, and the level of regeneration with feet off both pedals feels very natural – perhaps even a touch lighter than you might expect from petrol-engine braking. The 80kW (107bhp) motor has been set up to creep gently on zero throttle and the hill-hold handbrake is electronic, so a smooth getaway is guaranteed. Gear selection is via a small joystick on the centre console: left and hold for neutral, left and forward for reverse, left and back for drive, hit the button on top for park. Revisiting the drive position will toggle between normal settings and a range-extending eco mode. I can’t say I liked driving the Leaf in eco mode. The setting remaps the throttle quite dramatically, making you feel like you’re driving with a large and squishy sponge strapped to the sole of your shoe. If I were anxious about making it home, though, I’m sure I’d be grateful for this soft-shoe mode. 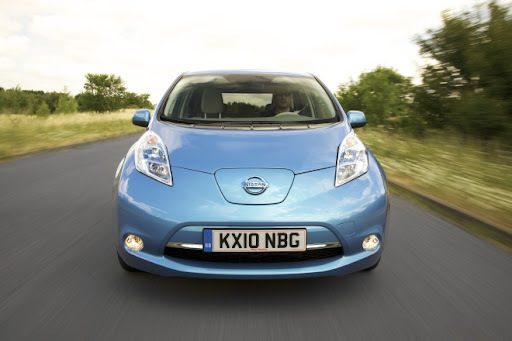 The Leaf’s substantial weight no doubt helps it to provide a smooth and well-damped ride. Composure on twisty back-roads was good, with the low-mounted battery helping to prevent body roll. Lifting off mid corner produced no surprises, and no doubt higher speeds would provoke mild understeer. I didn’t push it (as some other testers did on the day) because nothing about the Leaf encourages you to visit the ragged edge. And because nobody in their right mind will buy a Leaf to go B-road blasting. I’d rather grow little trees on the dash and see how far I can get between charges. Away from the peculiar world of road tests, the Leaf will make an ideal family car – indeed it is perfectly suited to school runs and shopping trips. Children will like sitting in the back because, to make space for a thicker layer of underfloor batteries, the rear seats have been raised noticeably. There’s still plenty of headroom for adults, but the stadium-style layout means a better view and, hopefully, less likelihood of motion sickness. 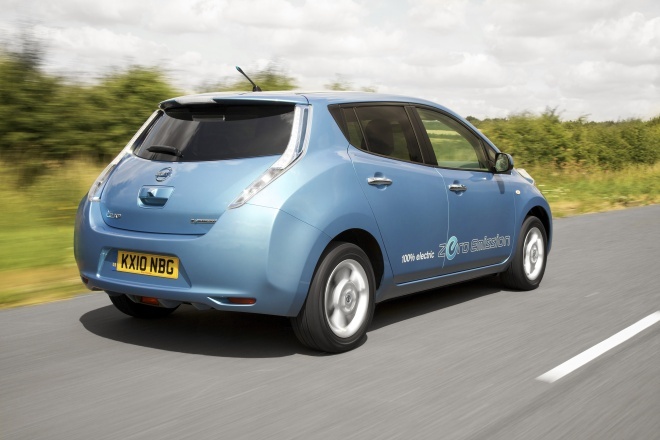 Some critics have said the Leaf looks a bit tall and gawky, and this is one good reason why. The Leaf’s battery charger lives behind its rear seats and the cover for this essential piece of kit creates an unusual, bowl-shaped boot. The rear seats do fold, though, meaning you might still slide an Ikea-type object through the hatch, providing it’s not too bulky. All in all the Leaf seems like quite a practical runabout, then – assuming it can be ordered in an interior finish other than the pale grey velour of our test car. 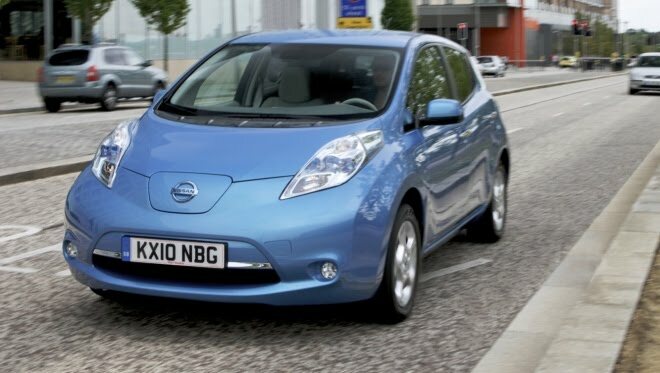 UK order books open on 1 September, but is the Nissan Leaf worth the £23,990 (after VAT and incentives) that it will cost to put one on your drive in March? To an extent, we can’t yet say, because the interior of our pre-production car was all hard painted plastic, because it was hand assembled with consequent squeaks and rattles, and because the UK warranty hasn’t yet been announced, among other imponderables. But on another level entirely – surprisingly to some, on an emotional level – is it worth the money? Hell yes. If you believe in a better future, buy it.